LOT 1 - Oil on board signed Moses (Grandma Moses lable inverso), 20" x 24 1/8", "Grandma Goes To The City"
LOT 2 - Oil on canvas attributed to James Hamilton, 30" x 50", "Sail-Steam ship in storm". LOT 3 - Pair of 18th century dueling pistols, 9 1/4. LOT 4 - T.Davidson & Co. Cincinnati .40 cal percussion target rifle(barrel J. Orahood) c.1867,45". LOT 6 - Hand carved seagull attr. to Kurt Ernst & Esther Schwitters, 24"x 4 1/2", C1940. LOT 7 - Pen drawing signed Kurt Schwitters 1940, 4 1/2" x 3 1/2", "Merry Xmas & HNY - Your Daddy". LOT 8 - Coloured pen drawing signed Don '40 (Ernst Schwitters), 4 1/2" x 3 3/4", "Gift to Esther". LOT 9 - Oil on canvas signed J.C.Dollman 1878, 16" x 24", "After the Hunt". LOT 10 - Oil on re-lined canvas in the manner of J. F. Herring Sr., 12 1/4" x 16 3/4", "Charles XII". LOT 11 - Oil on canvas in manner of William Dobson, 30" x 26", "Portrait of a Lady". LOT 12 - Oil on canvas signed Fantin, 15 1/2" x 11 3/4", "Vase with Flowers". LOT 13 - Violin with paper label Nicolas Lupot 1815 and bow in a fitted case. LOT 14 - Sixty-three Canadian silver one dollar coins. LOT 15 - Great Britain 1963 gold sovereign. LOT 16 - Bronze bust of a head signed Demanet mounted on a stone base, overall 16 1/2". LOT 17 - Large Tiger skin rug, approx. length 8'9". LOT 18 - 19th Century Meissen figure of young man with lantern, 12 3/4". LOT 19 - Coloured photograph of Gene Cernan- Apollo XVII- signed, 10 3/4" x 13 3/4". LOT 20 - Coloured Woodcut 31/50 signed Gen Yamaguchi 1948, 16 1/2" x 12", "Abstract". LOT 21 - Oil painting on panel signed Maxwell Bates 1971, 20"x 16", "Still Life". LOT 22 - Oil on canvas signed R. Gissing, 24" x 28", "Ghost River Flats". LOT 23 - Watercolour signed Bell-Smith 1868 (John), 16" x 12", "Portrait of Amelia Boddy". LOT 24 - Oil painting on panel signed H. Siebner, 12"x 16", "Roman Holiday". LOT 25 - Watercolour signed (Toni) Onley, 11.5"x 15", "Black Island, Harrison Lake, BC". LOT 26 - Captains "Gavel" commemorating the launch of Ship Melanope, 1876. LOT 27 - 800 silver candlestick "Wehrmacht- Fuhrungs-Stab, Fuhrerhauptquartier, Major d.Res v.Ilberg". LOT 28 - Marble double bust of a man and woman signed A. Frilli Firenze, 13", "Nozze Oro". LOT 29 - Large sculptured and polished matrix opal, approximately 4950 carats, 5 3/4" in height. LOT 30 - Emperors 8 jade horses with stands in box, approx. 4" each. LOT 31 - Iron made Tibetan Arhat Mudra statue with stand, 17". LOT 32 - 20th Century Chinese Sang de Boeuf vase on hardwood stand, vase 17 3/4"
LOT 33 - Pair of green and gold glazed Dogs of Foo, 18 1/2". LOT 34 - Ladies 14kt. gold emerald and diamond dinner ring with appraisal. LOT 35 - Pair of marble table lamps with ormolu decoration. LOT 36 - Iranian Tabriz carpet, approx. 6'6" x 9'8". LOT 37 - 18th Century gilded silver pair cased Verge pocket watch marked Will Kipling. LOT 38 - Pair of early Victorian brass candlesticks, 21 1/2". LOT 39 - Oriental carved ivory figure of a standing lady holding lotus flower on stand, overall 11". LOT 40 - Military watch marked Rolex, 2" with winder. LOT 41 - Oil on canvas in manner of Sir Godfrey Kneller, 30" x 25", "A Gentleman". LOT 42 - Pair oil on canvas attr. to David Cox, 12"x 16","The Wycliff,River Wye & Chepstow Castle". LOT 43 - Oil painting possibly signed W. Jenkins, 20" x 30", "York by Moonlight". LOT 44 - Oil on canvas signed in letter A. Serri, 15 3/4" x 19 3/4","Still Life - Fruit". LOT 45 - Oil on canvas signed Jan Sluyters, 19" x 21", "Still Life". LOT 46 - Oil on panel signed Louise Rayner, 5"x 8", "Marketplace Selby". LOT 47 - Oil painting after Sebastian Pether, 20" x 24", "Fishing by Moonlight". LOT 48 - Drawing signed Laura Knight, 8"x 11 1/4", "Circus with Elephant". LOT 49 - Victorian coromandel pietra dura inset belt closing book slide. LOT 50 - Russian silver niello worked pipe. LOT 51 - Alabaster bust of a young lady with button on base marked Schumaker, 7 1/4". LOT 52 - Set of 4 fine George IV telescopic candlesticks, Sheffield 1825, maker FW&D, 7-9". LOT 53 - George III lidded tankard 1780, maker IK, 6 1/2". LOT 54 - Liberty and Co. Sterling silver Art Nouveau chalice, Birmingham 1902, 7 5/8". LOT 55 - Late 19th century Imari charger, 21 1/4". LOT 56 - Pair of marble inset Chinese carved hardwood jarniniere stands. LOT 57 - Chinese Imari bowl on a fine hardwood stand, 8 1/4". LOT 58 - Pair of red ground cloisonne vases on stands, 7". LOT 59 - Antique Persian Kashan decorated with birds and building, 6'10" x 4'5". LOT 60 - Bronze statue of a Cheyenne Warrior signed Jim Reginbal, 21"x 21". LOT 61 - Oriental carved ivory figure of a standing woman on wooden base, overall 12 3/4". LOT 62 - WWII Lufwaffe military watch. LOT 63 - Set of eight 19th. century Chinese heavy bronze plates, 11 1/4". LOT 64 - Chinese magnifying glass with pierced ivory handle and gilt metal support in case, 12". LOT 65 - Pair of Hoi An Hoard blue and white ceramic small vases, 2 1/4". LOT 66 - Antique leather and wood dentist chair circa 1880's. LOT 67 - Art glass vase signed R. Lalique with raided bird decoration, 9 1/2". LOT 68 - Staffordshire dog. LOT 69 - Oil on canvas signed C.D. 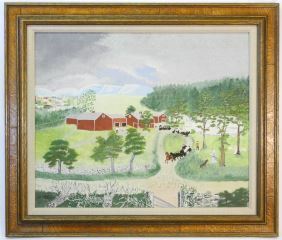 Graham 95, 26"x 36", "Valley Farms". LOT 70 - Oil on canvas signed Mary Riter Hamilton, 10 3/4" x 13 3/4", "Flower Garden". LOT 71 - Watercolour signed F.M. Bell-Smith, 23" x 17", "Mountain Waterfall". LOT 72 - Oil on board in the manner of Maurice Cullen, 11 5/8" x 15 1/2", "Building -Cache River #2"
LOT 73 - Ink Sketch signed with monogram of Manly McDonald, 5.25"x 3.25", "Flatlands". LOT 74 - Danish bird decorated letter opener stamped Georg Jensen- Allan Scharff 925 S, 7 1/2". LOT 75 - Middle Eastern three piece silver cigar smokers set-Alladin's lamp lighter,tray & vesta. LOT 76 - Hallmarked silver salver- London 1838, maker GRC, 10 1/2". LOT 77 - Four spiral twist stem glasses, 7 3/4" tallest. LOT 78 - Victorian brass and ivory bound walnut book slide. LOT 79 - 19th century tortoise shell cigar case, 5 1/8". LOT 80 - Pair of octagonal shaped cloisonne vases on stands, 7 1/4". LOT 81 - Two hippopotamus teeth- 21" & 14". LOT 82 - Bulova WWII American GI wristwatch. LOT 83 - Bronze figure of a man in broken chains, 16" including base. LOT 84 - Pair of antique Meissen porcelain figured sweetmeat candleholders, 8 1/2" h.
LOT 85 - 19th Century Sevres Putti painted porcelain blue and white plate, 9 3/4". LOT 86 - Inuit carved whalebone sun, 12"x 28". LOT 87 - 16th. century coloured map dated 1566- Transilvania, 14" x 18 1/2". LOT 88 - Continental Adolph Nathan stick barometer, 31". LOT 89 - Colour lithograph signed Marc Chagall 44/90, 10 1/2" x 13 1/2", "Eiffel Verte"
LOT 90 - Oil on canvas indistinctly signed 22 1/2" x 17 1/2", "The Norman Milkmaid". LOT 91 - Oil painting mounted on board, 24"x 20 1/2", "Floral Study". LOT 92 - Drawing signed Laura Knight, 11 1/4"x 7 1/2", "Clown". LOT 93 - Watercolour signed W.(Walter) Langley, 6" x 5", "Man wearing Tri-Corner Hat". LOT 94 - Pair of oils on panels- one signed William Oliver, 9" x 12", "Coastal Village Scenes". LOT 95 - Hallmarked silver 4 piece open salt set in case, Birmingham 1892/3. LOT 96 - 19th century Anglo Indian silver ewer with cobra handle, 12 3/4". LOT 97 - Islamic illuminated page- "A Prince with Attendants", 7 1/4" x 4 1/2". LOT 98 - Islamic double illuminated page- "Dancers" and "Courtyard Scene", 6" x 8 1/4". LOT 99 - Georgian mahogany two bottle tantalus. LOT 100 - Oil on canvas signed Myfanwy (Pavelic), 26"x 20", "Untitled (woman at table)". LOT 100A - Porcelain figured boat, 15 1/4". LOT 101 - Oil painting signed Ina Meares, 47"x 57", "Toiles sur Toils". LOT 102 - Carrara marble sculpture by Yeon-Tak Chang, "Wave", 14". LOT 103 - Lithograph signed Marc Chagall, 13" x 8", "L'Envolee Magique". LOT 104 - Fine Satsuma bowl, 7 1/4" in diameter. LOT 105 - Pair of yellow ground cloisonne vases on stands, 7". LOT 106 - Pair of early Victorian bell metal floor standing candlesticks, 55". LOT 107 - Semi-Antique Bokhara rug, 3'8" x 2'9". LOT 108 - Cold painted bronze of 4 birds on a branch signed G.E. Schutz, 7 1/4". LOT 109 - 19th. century parquetry inlaid cylinder desk. LOT 110 - Late 19th. century Continental inlaid mahogany armchair. LOT 110A - Set of eight Chinese export Imari patterned wall plates. LOT 111 - Pair of paintings on ivory signed AH & Hilliard, 2", "Ladies in blue & brown". LOT 112 - Miniature on ivory signed Peter Lely, 3" x 2","Lady in blue dress". LOT 113 - Late 18th./early 19th Century icon- St.Nicholas, 12" x 10 1/2". LOT 114 - Drawing signed Laura Knight, 11"x 7 1/4", "Dancers". LOT 116 - Twelve piece Sterling silver dresser set in a fitted case. LOT 117 - Two pages of early British Stamps including four penny blacks and three 2 pence blues. LOT 118 - Watercolour signed T.Mower Martin RCA 1900, 8" x 21", "Mt. Rainier". LOT 119 - Oil on signed Lawley (John D.), 9" x 12", "Sable Island". LOT 120 - Edwardian silver dish ring, Chester 1905, GN/RU. LOT 121 - Black ground Mt. Fuji picture vase, 7". LOT 122 - Hallmarked silver tray commemorating the West Riding Reg't, Sheffield 1915, 23 1/2". LOT 123 - Italian early 20th century parasol with plated handle having a green stone, 33". LOT 124 - Louis XVI style bronze chandelier. LOT 125 - Persian carpet, approximately 15' x 10'6". LOT 126 - Glazed stoneware table lamp signed Gambone (Guido) with donkey mark, 17 7/8" Ht.